On the 11th (Thu), meet the residents at Cretaquarium - Thalassocosmos, learn about winemaking at Winery Stilianou, and then delve into the distant past at The Palace of Knossos. On the next day, take in the architecture and atmosphere at Church of Saint Titus, then take an in-depth tour of Ιστορικό Μουσείο Κρήτης - Historical Museum of Crete, then learn more about the world around you at The Natural History Museum of Crete, and finally take an in-depth tour of Heraklion Archaeological Museum. Before you visit Heraklion, use our trip planner to discover what you can do and see there. Auckland, New Zealand to Heraklion is an approximately 31-hour combination of flight and bus. You can also do a combination of bus and flight; or do a combination of train, bus, and flight. The time zone changes from New Zealand Standard Time to Eastern European Time, which is usually a -10 hour difference. While traveling from Auckland, expect much warmer days and a bit warmer nights in Heraklion, ranging from highs of 34°C to lows of 26°C. Finish your sightseeing early on the 12th (Fri) to allow enough time to ride a ferry to Akrotiri. On the 13th (Sat), enjoy the sand and surf at Caldera Beach, learn about winemaking at Boutari, J., & Son Wineries S.A., then do a tasting at Venetsanos Winery, and finally stroll through Red Beach. Get ready for a full day of sightseeing on the next day: explore the ancient world of Akrotiri, then enjoy the sand and surf at Perissa Black Sand Beach, and then tour the pleasant surroundings at Santo Horse Riding. For reviews, ratings, maps, and more tourist information, read our Akrotiri trip itinerary maker website . Ride a ferry from Heraklion to Akrotiri in 2 hours. In July in Akrotiri, expect temperatures between 35°C during the day and 27°C at night. Cap off your sightseeing on the 14th (Sun) early enough to catch the ferry to Mykonos Town. Kick off your visit on the 15th (Mon): enjoy the sand and surf at Panormos Beach and then take a stroll through Little Venice. To find traveler tips, ratings, and other tourist information, use the Mykonos Town trip maker . 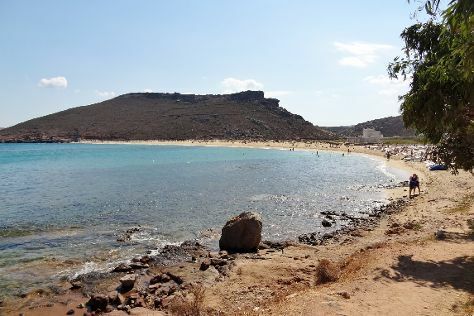 You can ride a ferry from Akrotiri to Mykonos Town in 2 hours. In July, plan for daily highs up to 33°C, and evening lows to 26°C. Cap off your sightseeing on the 15th (Mon) early enough to travel to Athens. Athens is known for historic sites, museums, nightlife, shopping, and fun & games. Your plan includes some of its best attractions: steep yourself in history at Acropolis of Athens, wander the streets of Plaka, explore the world behind art at National Archaeological Museum, and take an in-depth tour of Acropolis Museum. To see where to stay, traveler tips, other places to visit, and other tourist information, you can read our Athens trip itinerary maker website . You can do a combination of flight and subway from Mykonos Town to Athens in 2.5 hours. Other options are to ride a ferry; or do a combination of ferry, taxi, and flight. Traveling from Mykonos Town in July, you will find days in Athens are somewhat warmer (38°C), and nights are about the same (28°C). Finish your sightseeing early on the 18th (Thu) to allow enough time to travel to Dubrovnik. Kick off your visit on the 19th (Fri): wander the streets of Old Town and then explore the ancient world of Walls of Dubrovnik. Get ready for a full day of sightseeing on the 20th (Sat): get engrossed in the history at Rector's Palace, step off the mainland to explore Dubrovnik Boat Rentals, and then step off the mainland to explore Island of Lokrum. To see traveler tips, other places to visit, where to stay, and more tourist information, read our Dubrovnik travel route planner . You can fly from Athens to Dubrovnik in 5.5 hours. Other options are to do a combination of flight and bus; or drive. The time zone difference when traveling from Athens to Dubrovnik is minus 1 hour. Traveling from Athens in July, expect Dubrovnik to be a bit cooler, temps between 34°C and 24°C. Finish your sightseeing early on the 20th (Sat) to allow enough time to ride a ferry to Korcula Town. Start off your visit on the 21st (Sun): don't miss a visit to Atelier Abel, make a trip to Korcula Old City, then take in the architecture and atmosphere at St. Mark's Cathedral, then examine the collection at House of Marco Polo, and finally cast your line with a fishing tour. Here are some ideas for day two: view the masterpieces at Bags by Kristina, enjoy the sand and surf at Vela Przina Beach, and then enjoy the sand and surf at Pupnatska Luca Beach. To find ratings, more things to do, other places to visit, and other tourist information, you can read our Korcula Town attractions site . Traveling by ferry from Dubrovnik to Korcula Town takes 2 hours. Alternatively, you can do a combination of car and ferry. In July in Korcula Town, expect temperatures between 36°C during the day and 26°C at night. Finish your sightseeing early on the 22nd (Mon) so you can travel to Hvar. Kick off your visit on the 23rd (Tue): contemplate in the serene atmosphere at Franciscan Monastery, contemplate the long history of Spanjola, and then tour the pleasant surroundings at Dubovica. On the 24th (Wed), you'll have a packed day of sightseeing: contemplate in the serene atmosphere at St. Stephen's Cathedral and then head off the coast to Pakleni Otoci. 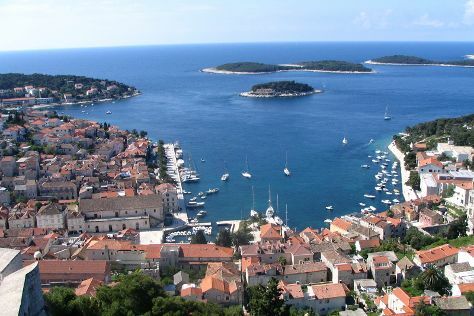 To find photos, where to stay, maps, and tourist information, read Hvar tour itinerary planning site . Getting from Korcula Town to Hvar by combination of ferry and taxi takes about 2 hours. Other options: ride a ferry. In July, plan for daily highs up to 36°C, and evening lows to 26°C. Finish your sightseeing early on the 24th (Wed) so you can ride a ferry to Split. Start off your visit on the 25th (Thu): don't miss a visit to Fruit's Square (Trg Brace Radic), take in the spiritual surroundings of Cathedral and Bell Tower of St. Domnius, then explore the ancient world of Temple of Jupiter, and finally contemplate the long history of Diocletian's Palace. Get ready for a full day of sightseeing on the next day: admire the masterpieces at Galerija Mestrovic, identify plant and animal life at Marjan Park, and then let the river carry you with a rafting and tubing tour. To see more things to do, reviews, ratings, and tourist information, read our Split trip planner . Getting from Hvar to Split by ferry takes about 1.5 hours. In July, daytime highs in Split are 36°C, while nighttime lows are 26°C. Wrap up your sightseeing on the 26th (Fri) early enough to travel to Copenhagen. 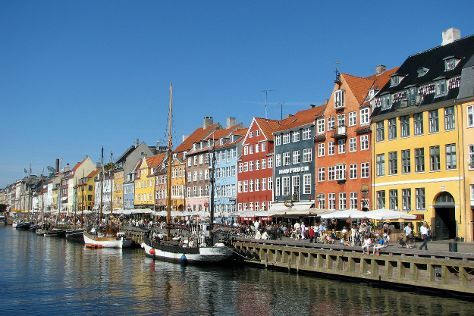 Copenhagen is known for theme parks, historic sites, museums, nightlife, and parks. Your plan includes some of its best attractions: get in on the family fun at Tivoli Gardens, see the interesting displays at Ny Carlsberg Glyptotek, explore the historical opulence of Amalienborg, and get engrossed in the history at National Museum of Denmark. To find traveler tips, reviews, photos, and other tourist information, use the Copenhagen day trip planning tool . You can fly from Split to Copenhagen in 5.5 hours. Alternatively, you can do a combination of flight and train; or drive. In July, Copenhagen is slightly colder than Split - with highs of 26°C and lows of 14°C. Wrap up your sightseeing on the 30th (Tue) to allow time to travel back home.